This white Irish hair bow features a green shamrock and is a suitable size for a baby or child. This Irish hair clip with a shamrock is a smaller size that is ideal for a toddler or baby. 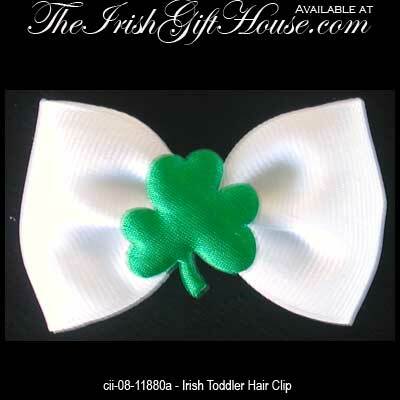 The small white fabric Irish hair bow from The Irish Gift House has a green fabric shamrock and a hinged metal clip. The shamrock hair bow is ideal for St. Patrick's Day or for child's picture day and measures 1 1/2" tall x 2 1/4" wide..